There are few computer tools that have the longevity and staying power of Adobe's Photoshop, and version 7 offers improvements, fixes, and new features that any digital photographer can appreciate. Adobe Photoshop 7 for Photographers places these new features in perspective and teaches their use, plus a whole lot more. Approaching Photoshop from the viewpoint of a photographer, the author places much emphasis on tools for digital image acquisition, color correction, color management, and retouching. Color management--the science, art, and voodoo of synchronizing Photoshop, the computer monitor, and the printer for consistent color reproduction--is discussed in detail. Any Photoshop veteran would agree that this is one of the most important and difficult parts of any system to configure, but Evening handles it gracefully and patiently. 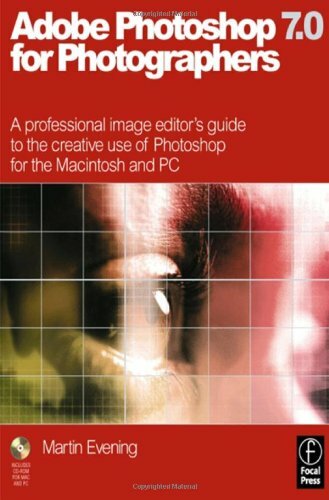 This book is not written for the experienced Photoshop user, however; it's clearly aimed at the experienced photographer who may or may not have Photoshop experience. Toward that end, there are chapters that detail the nuances of file management, scanning or uploading pictures into the computer, the interface, and configuring Photoshop for optimal use. Even those with Photoshop experience should flip through every page, though. The book includes something informative on virtually every topic and tool, and to turn a page without glancing through each paragraph would mean letting important information pass by without a glance. No shortcuts were taken either with the enclosed CD-ROM, which includes 14 QuickTime movies demonstrating techniques taught in the book. Also on the CD-ROM are PDF files of some of the techniques, along with the source images used for many of the projects.